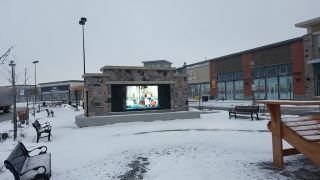 Advanced designed and installed a digital signage display at Park Place, an outdoor mall in Barrie, Canada. Because of the outdoor environment, utilizing specialized high brightness videowall panels was crucial to the success of the project. Advanced selected a DynaScan display because of its robust LCD panels that provide a brightness of 3,000 Nits, opposed to the average LCD brightness of 500 Nits. Additionally, the LCD option creates a seamless look, with one large image in high resolution, which is unique for an outdoor application. Since the DynaScan LCD videowall is meant for indoor use, Advanced had to design a custom solution that would protect it from Canada’s severe outdoor elements. To do so, they partnered with Batko to design a custom enclosure that was weather-proof, tamper proof and temperature regulating. The customized enclosure effectively manages the heat of the video wall, consistently keeping an optimal temperature inside. Advanced also had to customize a content distribution solution. The Park Place mall central office, where the content was to be transmitted from, was approximately 600 feet away from the display itself. Additionally, Advanced installed a videowall processor with 4K inputs instead of the traditional “daisychaining” configured with most projects of this nature. The specialized processor allows Park Place to add displays in the future, if they so choose. Now, Park Place uses the display as a focal point for shoppers and source of advertising revenue. They broadcast live sporting events and sell ad space to the mall’s retailers.